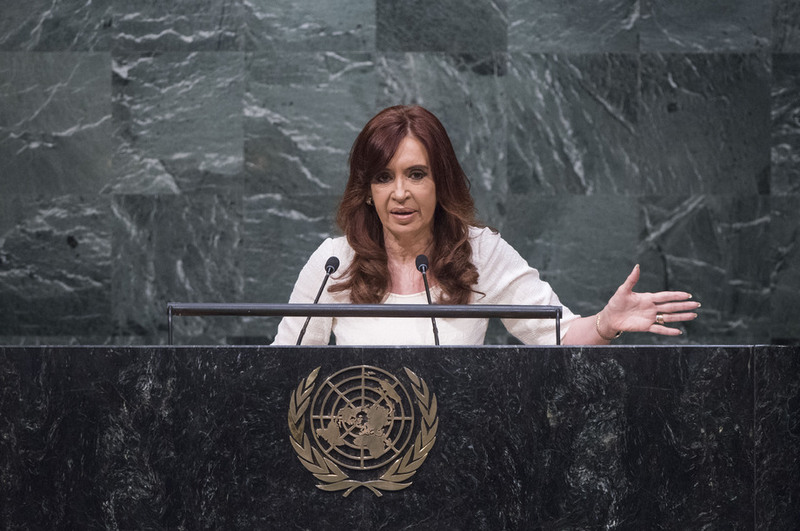 CRISTINA FERNÁNDEZ, President of Argentina, noting the General Assembly had recently adopted a resolution on the guidelines for the restructuring of external debt of countries, said it was crucial that States enjoy the sovereign right to decide their own macroeconomic policy. That was a logical principle, she said, noting that creditors established timetables for repayment when a company or municipality defaulted. Argentina had gone bankrupt in the early 2000s, leading to a default in 2001, but it had rebuilt itself. Politicians had retaken control of the Government and decided it was necessary to allow Argentina to grow in order to be able to pay. That was economic logic. Argentina then began its inexorable progress, which led to paying off its debt to the International Monetary Fund (IMF) in 2005. The State was moving towards sustainable development. “We do not forget that the greatest growth occurred among the emerging countries,” she said. The recent global financial crisis had begun here, in the United States, “the very heart of international finance”, she said. It had then extended to the Eurozone. It was a euphemism when people spoke of “saving countries”; that really meant saving the banks. It was essential to have regulation to ensure that the flood of resources into the financial sector came back into the real economy, but no such rule was implemented. In the Eurozone, that had led to historic levels of unemployment and unprecedented financial woes. The collapse of financial institutions had now threatened developing countries, which had previously been growing at a rapid rate. The current refugee crisis was caused by “financial predators”. According to the IMF, 1 per cent of the global population held a shockingly large percentage of the world’s wealth. She asked how the world could talk about gender empowerment when resources were so inequitably distributed. It was time to inject resources into the “real economy” — to create jobs in production as engines driving society. She went on to commend the United States and Iran, as well as the five permanent members of the Security Council and Germany, for having reached an agreement on nuclear issues that would bring more stability to a world plagued by conflict. She described the history of Argentina’s relationship with Iran’s nuclear programme, noting that her country was a producer of nuclear fuel, but a leader in nuclear non-proliferation. She also discussed the Asociación Mutual Israelita Argentina (“AMIA”) bombing of 1994, which had occurred in her country. The case of that terrorist attack remained blocked, she said, stressing that her country would tirelessly seek the truth. Vulture funds had said that Argentina was complicit with Iran; however, if that was true, what did that mean for United States President Barack Obama, she questioned. “We can’t have double standards in diplomacy”, she stressed in that regard. On the Middle East, she asked who was financing the “freedom fighters” that were now part of ISIL. The world saw horrendous scenes of events taking place in Syria, with three or four cameras filming them. It was as if there was a Hollywood set there. On her region, she said that it was triumphant to see the President of Cuba back at the Assembly. Latin Americans had struggled to ensure that Cuba could return to the international community; in that regard, she recognized the United States, which had “opened its mind”, and thanked Pope Francis for his role in that agreement. The Pope had said that “money could not continue to determine politics”. Similarly, conflicts could not be resolved by guns and bombs, but through talk and respect among parties. Her region had no religious or cultural conflicts, and it was open to migration, which was necessary to establish a fairer world. Argentina’s economy would continue to grow at an estimated 2.7 per cent annually, and that growth was based on developing a more egalitarian society.